The National Science Foundation has awarded Carnegie Mellon University’s Jing Lei and Ryan Tibshirani Faculty Early Career Development (CAREER) awards. 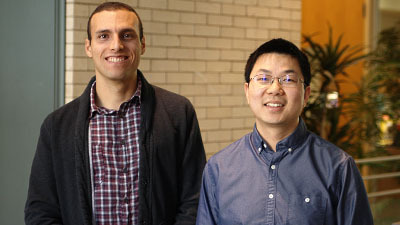 Lei and Tibshirani, both assistant professors in the Dietrich College of Humanities and Social Sciences’ Department of Statistics, each received five-year, $400,000 grants for their projects “Modernizing Classical Nonparametric and Multivariate Theory for Large-scale, High-dimensional Data Analysis” and “Locally Adaptive Nonparametric Estimation for the Modern Age — New Insights, Extensions, and Inference Tools,” respectively. The CAREER Award is the NSF’s most prestigious honor designed to support junior faculty who exemplify the role of teacher-scholars through their outstanding research and excellent teaching. “These CAREER awards are a testament to the innovative contributions that both Ryan and Jing are making in their research,” said Christopher R. Genovese, head of the Statistics Department. “They are emerging leaders in the field, and their work is advancing our understanding of statistical inference with large, complex and high-dimensional data. “I am confident that these projects will have a significant impact across many disciplines and problems,” Genovese added. The explosion of big data also has led to an onslaught of theories and methods to analyze massive amounts of data. Lei’s project will analyze when certain methods work and when they do not — and will determine why. He will then use that understanding to create reliable statistical methods that are widely applicable across fields such as astronomy, medical screening, genetics, psychiatry and brain sciences. For example, Lei’s work involves classification of stomach tissue images. Most methods put each tissue image in one of three classes — healthy and two types of illness. Yet, there is not a well-accepted method to report uncertainty or ambiguity between classifications. Lei’s project will help solve this problem by developing methods that lead to more flexible classifications with adequate ambiguity quantification. Tibshirani develops mathematical models that work to understand simple patterns or structures that may be present in complicated data sets. With these models, he can leverage patterns and structures to predict unseen values of data. He will use the award to develop better mathematical models and software to more effectively forecast seasonal epidemics like influenza and dengue fever to help policymakers design and implement countermeasures. Tibshirani will do this by using nonparametric models — flexible modeling of smooth trends without specific assumptions about form or shape — instead of the currently used parametric models. The models also will have other applications in epidemiology, astrophysics, financial and artificial intelligence because, in data-rich settings, increased flexibility will lead to greater statistical accuracy. Lei and Tibshirani, who both joined CMU’s faculty in 2011, credit the Statistics Department’s outstanding faculty — at the junior and senior levels — and its collaborative environment with helping them achieve success in the classroom and in their research.